Police in New York are on the lookout for two Italian plumbers dressed in blue overalls and colorful caps who are accused of beating the crap out of a cabbie who drove them to the wrong castle. Mario and Luigi (surnames unknown) joined two other men for a cab ride home from a Halloween party early on the morning of November 1. At some point during the journey, one of the men reportedly reached into the cabbie's pocket, whereupon he stopped at a gas station and asked his passengers to pay the fare and leave. Unfortunately for the driver, the hot-blooded duo reacted violently; apparently incensed over once again winding up at the wrong place, they attacked the driver while a third man, dressed in a white tuxedo, looked on. Mario and Luigi wrestled the cabbie to the ground, roughed him up a bit and then ran off with his money. 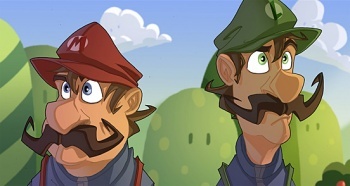 Police are on the lookout for two mustachioed plumbers with bulbous noses, thick accents, red and green monogrammed caps and a propensity for shouting, "It's-a me!" The public is being warned that while the pair is not believed to be armed, they may attempt to jump onto onlookers from great heights if they're cornered.